I LOVE Grasscloth. I've decided (which is a big step) to put grasscloth in our powder room. Natural grasscloth is actually relatively inexpensive. I've used this website for a number of clients and I highly recommend it. I've already received round one of sample but none of them worked, so I'm on to round two. Next step... pick a grasscloth and build a design board! Thanks for the site! Our new home has the same look actually and I am in the process of changing. love that you have allt hat gold hardware too. Isn't it the worst? I love the look of grasscloth. But the visible seams have always bothered me. I wish there was a way to make them less visible. 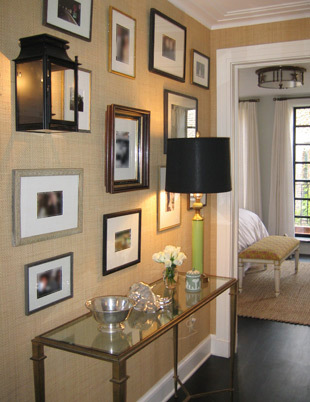 I was just thinking the exact same thing this morning about our powder room... Love the inspiration photos. It would look fabulous!! I love grass cloth too! I was warned, as a just out of school interior designer, not to use grass cloth in bathrooms or kitchens because the natural material can hold on to smells. This might be something you want to ask your wallpaper person about. Your powder room is going to look so beautiful! I'm going to check out that website that you referenced because I would love to see what they have! I love that look! The inspiration pictures are gorgeous. I want to echo Hannah's questions about the application. Also, what do you know about its durability? Will it start to peel after a while in the high humidity of the bathroom? I love the look of grasscloth too! I am thinking about putting it in my stairwell and upstairs hallway. (I was inspired by your ceiling! )My only qualm is that I have an archway between the livingroom and stairwell area that is not trimmed out in wood (just drywall) so I feel like the transition from grasscloth to drywall with the cut edges around the archway would look BAD! What do you think? Do you have any experience with "ending" the glasscloth somewhere other than against wood trim? Wonderful, can't wait to see the end result! I fell in love with a grasscloth paper form Osborne and Little a while back only to find that it was cost prohibitive. 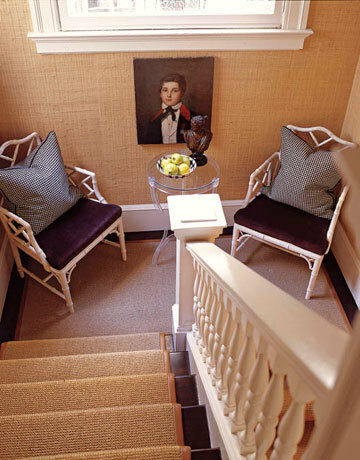 I worked with a decorative painter to duplicate the look and I now have a lovely faux grassclth wall in my foyer. Fingers crossed that one of the new samples is "it!" I am traumatized by the photo of the current wallpaper. I understand why you must change it Right. This. Minute.!!!! OHH that's going to be just GORGEOUS!!! Bravo on taking the plunge and going for it! Can't wait to see after pics! You can not go wrong with grasscloth!!! Looking forward to seeing how you transform this bathroom! Bryn, this post came at the perfect time. I'm currently ordering samples for a client and LOVE these inspiration photos. Thanks! Your bathroom will look great! Will you strip down the current wallpaper or just paper over it? I have even seen the grasscloth wallpaper wrapped around floating shelves - looks super fancy and it's an easy DIY! I've dreamed of hanging grasscloth in our dining room but always end up discouraged. Do you have any tips for hanging it? Do you suggest to drop the DIY spirit and hire someone? I've always heard it is a beast to hang. It's going to look amazing. Can't wait to see! I love grasscloth, too! It's earthy and classy all in one. Can't wait to see how it turns out! 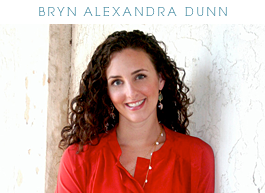 The grasscloth selections are lovely, Bryn. Any idea how they hold up in high humidity rooms, like a bathroom with a shower? Is it treated in any way? I love the 2nd one. It has some blues and greys in it. I love grasscloth and am going to do in our cabin dinning room I think. Can't wait to see how your powder room turns out. I'm a big fan of grasscloth too. Timeless and classic. It will be goreous in your powder room. Can't wait to see how it turns out! I've ordered several grasscloth samples from Design your wall in the past and I have to say, they never look like they do online! 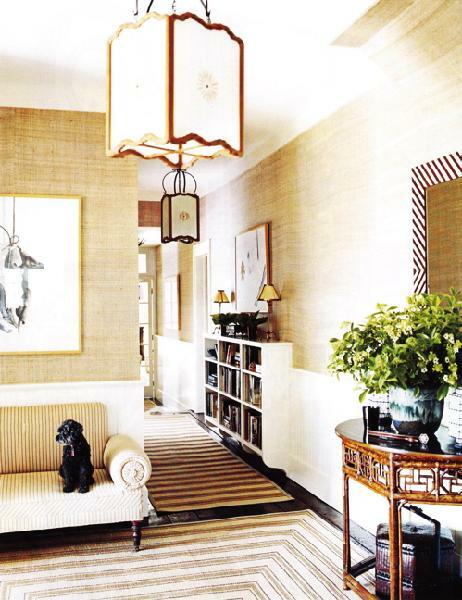 I love grasscloth & had it in the foyer of our previous home. However, my cats loved it also - great for sharpening those claws. 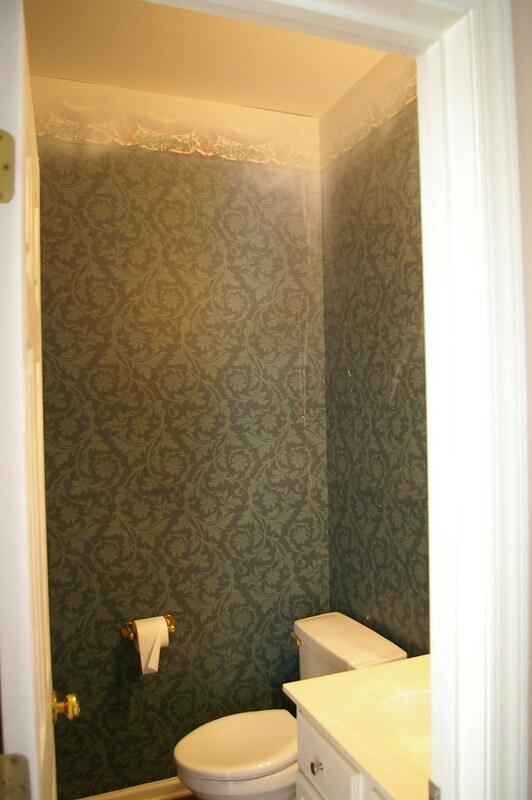 We have a bathroom that looks almost exactly like your powder room. But I think our wallpaper may be worse. It reminds me of those old "magic eye" posters. Any tips for removing wallpaper from bathrooms?